Your business has a great product or service, but you’re lacking a logo that really shows off what you do and who you are. Which means you are potentially losing business because of a lack of branding. If this is familiar territory, you’re in the right place. 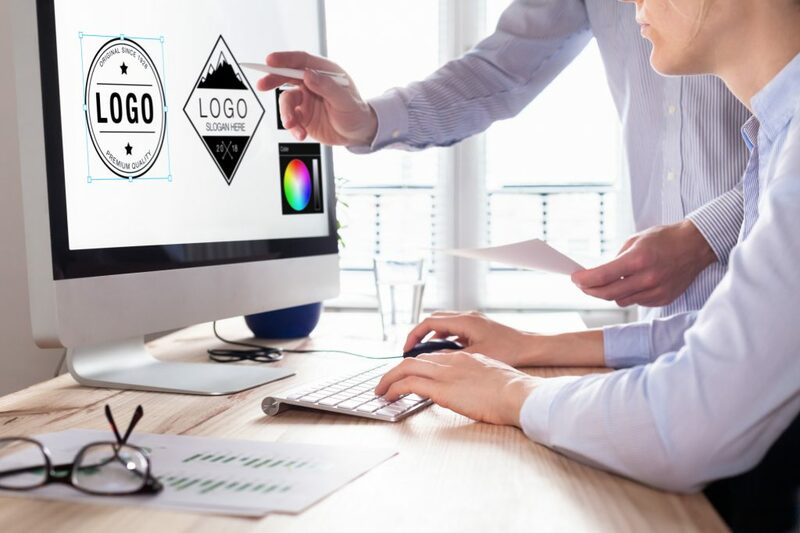 In this post, we go over the most popular and trending modern logo designs that are going to dominate the branding space in 2019. You’ll be able to take a look at what’s hot, and figure out which style suits your business. Then it’ll be off to the races (or print shop) to get your new logo out into the world. You read that right… the ’80s are back! And it’s not just in fashion and music trends. It’s in logo design as well. When you think of 80s design, there are a few things that pop to mind: like the use of bold colors and in-your-face patterns. Maximalism was also the word of the era, as 80s logos and design in general looked to go big or go home. The same is true for 2019, with 80s inspired looks already showing up all over the business world. And experts are predicting this trend will continue through the year. Read more here about how maximalism is beating out minimalism moving forward. Another trend we’re seeing this year is the use of geometric shapes. But not only that: mixing them with minimalist design allows the shapes to pop in unexpected ways. Geometric shapes like squares, triangles, and circles are imprinted in our minds, and their tangible forms convey meanings to us. For example, they tend to convey a sense of efficiency, since they make use of space in an efficient manner themselves. This then makes viewers attribute that idea of efficiency to the brand using the logo. They also convey structure and organization. And when you put geometric shapes into a minimalist setting, it makes the shapes (and the perceived attributes) pop even more. All of these are attributes that businesses certainly want to be thought of as having! When you look at a computer screen, you are inherently looking at a two-dimensional image. So it stands to reason that any logo that is able to convey three-dimensionality will stand out. That’s why semi-flat logos are having a moment, especially online and in mobile apps. They are created by utilizing gradient colors. This technique creates the appearance of a shadow, and thus gives the logo a slightly 3D look. Plus, an effective use of angles in the design will enhance that look even further. Another major benefit of using this kind of design is that since it’s so popular in the tech sector, using it will make your company seem like you are up to date and modern. The textbox logo isn’t exactly the newest kid on the block. They’ve been around forever, and have been used in every conceivable branding situation. But the reason for this is that textbox logos are extremely versatile. Changes in the box color, the internal font, and the size of the font can mean drastically different looks. The textboxes function as borders around the letters of the writing inside them. And the solid nature of the box means that even when the entire logo is placed over another graphic, the logo stands out. The way the box also separates the font from the rest of the graphic makes using variations in font type is also an easy possibility. This gives you design options wherever you’re using the logo, from print ads to online inforgraphics. So you can go from sleek and modern to cool and retro without moving away from the textbox format. We talked about the use of gradient colors in the section on semi-flat logos. But designers are using them in modern contexts beyond just making three-dimensional looks. It’s a known that color conveys emotion. So the idea is that if you can show a range of similar colors, it conveys movement of that emotion. And the psychology of color is crucial in choosing your logo’s palette. Not only that, but having a color gradient allows for a look that is more distinct from other logos out there. If you only use solid colors, you run the risk of being more reminiscent of all the other logos also doing that. And as long as the logo design uses colors that are near each other on the color wheel, the gradient look will really pop. Another great aspect of using gradient colors in a logo is that it translates really well to moving GIF’s, which are more and more common these days. Remember how we mentioned the resurgence of 8’s looks? Well, neon logos are another offshoot of that. Neon is being used more and more, and designers predict that in 2019 this trend will only increase. This is clearly tied to the throwback 80s look that more and more people are utilizing in their design. Put simply, neon colors stand out! Whether it’s on a poster, in print, or online, it’s important to have something eye-catching. And neon accomplishes that in spades. It’s vibrant, alive, and gets your attention. And just when you thought everything was going to be about being big, bold, and standing out… we talk about hand-drawn logos. And actually, hand-drawn logos do stand out in their own way. We aren’t usually accustomed to seeing logos that don’t look like they were computer generated. So a hand-drawn logo really catches the eye because of the break from that expectation. They also give a feeling of authenticity, because the viewer feels like they can see the handiwork of the artist who drew the logo. This kind of personal touch often helps customers feel closer to a company, regardless of the company’s size. These are some of the modern logo designs that are trending this year. Pick a style that resonates with you and conveys the nature of your company’s brand. And for tips on how to then use that logo, check out this post on strategic web design!